Thrilling Thursday Summer Camp is the perfect break for parents and kids alike! These themed camps mix games, gymnastics, crafts, and snack during an indoor afternoon camp. Pinnacle Summer Camps are the perfect Activities for Kids Kansas City offering the right balance of physical activity and mental stimulation. 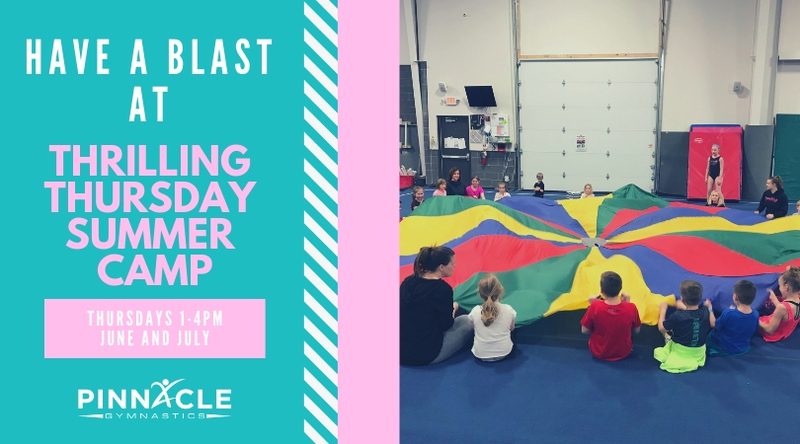 Thrilling Thursday Summer Camp 2019 is offered every Thursday from 1pm - 4pm. Ages 5 and up can stay all day with our Summer Day Camp Options! Want to learn more about Thrilling Thursday Summer Camp? Our campers will participate in a variety of themed activities that challenge the body and the mind. Activities are active, hands on, and cross a variety of genres. Don't miss out on our unique themes including STEM Camps, creativity camps, and more. Practice your reflexes when playing Andy's Coming!